The year is coming to an end, and it’s time to celebrate the New Year ahead. What better way to bring in the New Year than by throwing a green New Year’s party? By green, we don’t mean the red and green colors from your holiday decorations—we mean green as in environmentally-friendly. At Wheels For Wishes, we practice recycling everyday through our car donation programs that benefit local kids in your area. If car donation is on your list of New Year’s resolutions, we suggest that you donate your vehicle before 11:59 p.m. on New Year’s Eve to get a tax deduction for the 2015 year. You may be wondering why it’s important to throw a green New Year’s party. Every year, each person in the United States uses approximately 749 pounds of paper, according to the Ecology Global Network. In the U.S., 30 to 40 percent of our food supply is wasted, equaling more than 20 pounds of food per person per month. In addition, 35 billion plastic water bottles end up in the trash each year. Much of our food and many disposable cutlery or containers are wasted during or after holiday celebrations and parties, which is why it’s so important for us to try and “green” our parties a bit. By cutting back on food waste and switching disposable cups and plates to reusable, you can help to make a difference by reducing waste in your home. One of the best parts about going green is that you save money when you use reusable items, rather than purchasing disposable cups, plates, and silverware, which are often used just one time. If you don’t like using your own dishes for parties, purchase reusable dishes made of BPA-free plastic. For quick and easy clean-up, set out a bin for guests to drop off their dishes when they’re done using them. If you do use disposable silverware, have guests drop their silverware into the same bin and you can wash them by hand or put them in the dishwasher to be reused again and again. Many parties are filled with inexpensive, convenient food items that may taste great, but they aren’t the healthiest for our bodies or for the planet. Convenience foods are packed full of excess sugars, preservatives, food colorings, and other ingredients that are harmful to human health as well as the environment. Additionally, the Standard American Diet (SAD) tends to be very meat-heavy, which has its own set of problems. According to One Green Planet, 70 percent of global freshwater supplies are used for agriculture. 14.5 percent of global greenhouse emissions are produced by livestock, and 45 percent of global land is occupied by the livestock system. Animal agriculture is the leading driver of habit loss and deforestation, and 850 million people around the world are suffering from hunger. We could help to improve all of this if we all ate a plant-based diet as much as possible. For your New Year’s party, serve these plant-based snacks or meals and consider participating in Meatless Monday, or by simply eating less animal products and more plant-based foods. Eating and drinking locally are other important ways to make a difference in the New Year. Local food and beverages don’t have to travel across the country (or across the world) to reach your table, which means that less gasoline was used. This alone helps to keep the planet cleaner. To shop locally for your New Year’s party, visit a community co-op, natural foods store, or farmer’s market, and be sure to read labels or ask questions to learn about where your food is coming from. For more information about drinking locally, check out our infographic. If these tips seem overwhelming, you don’t have to dive in head first. Instead, try taking on a new task each week or each month, until it all becomes a habit that you don’t even have to think twice about. 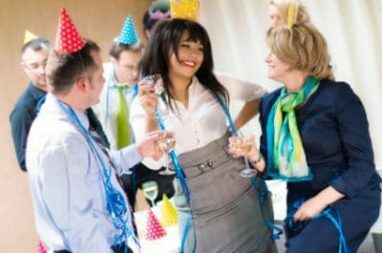 Parties provide the perfect opportunity to make changes in your lifestyle because you can encourage other people to jump on board and make changes for themselves. Plus, friends and family will be so impressed with everything you’ve done that they may even come to you for advice. If you’d like to take the full green plunge, consider donating your car to Wheels For Wishes. Learn more about the causes we support by finding a local chapter in your area.